« Are the Vancouver Canucks now Canada’s Team? 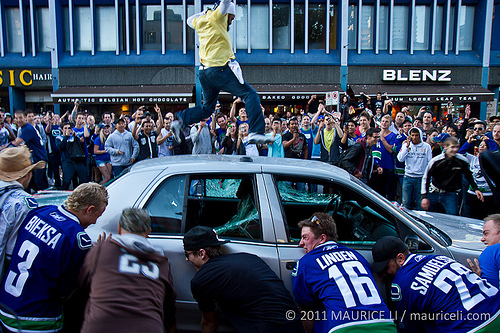 This entry was posted on June 16, 2011 at 10:28 pm and is filed under Sports with tags Boston Bruins, Looting, Riots, Sidney Crosby, Stanley Cup Playoffs, Steve Yzerman, Vancouver Canucks, Wayne Gretzky. You can follow any responses to this entry through the RSS 2.0 feed. You can leave a response, or trackback from your own site. Well spoken Jord. I have seen throughout the years how hockey fans (inclusing parents of young children) get carried away by the emotions of a loss at the rink. An otherwise very nice person can turn into someone one does not want to be near in the heat of battle. Good point about the mob mentality too. a very sorry event in Vancouver and Canada’s sports history.